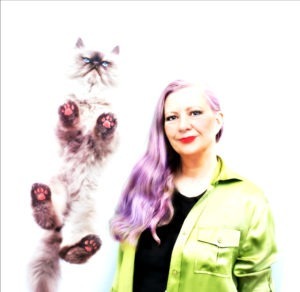 Tommy: from animal cruelty survivor to Sir Thomas Trueheart CatCon Star and advocate By Layla Morgan Wilde. 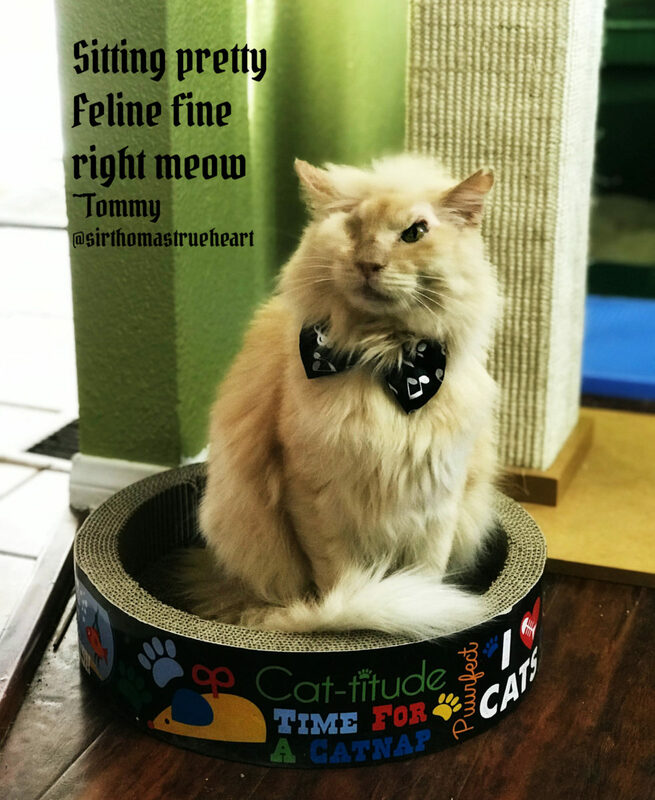 One of the most inspiring cat tales I’ve ever come across is about Tommy a.ka. Sir Thomas Trueheart. Over the past year I’ve learned the inside scoop about him from my friend Connie Cunningham. 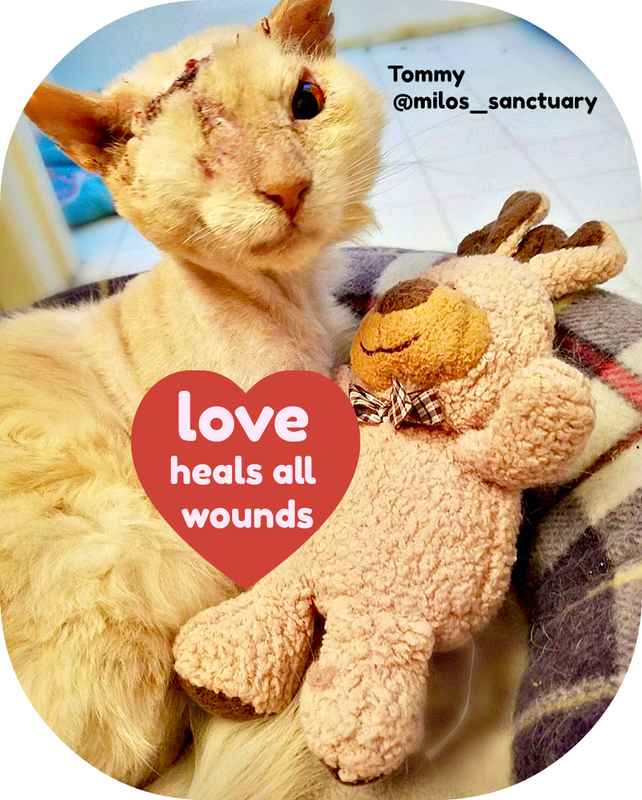 Connie volunteers at Milo’s Sanctuary the rescue organization that saved his life and she manages his Instagram account @sirthomastrueheart. 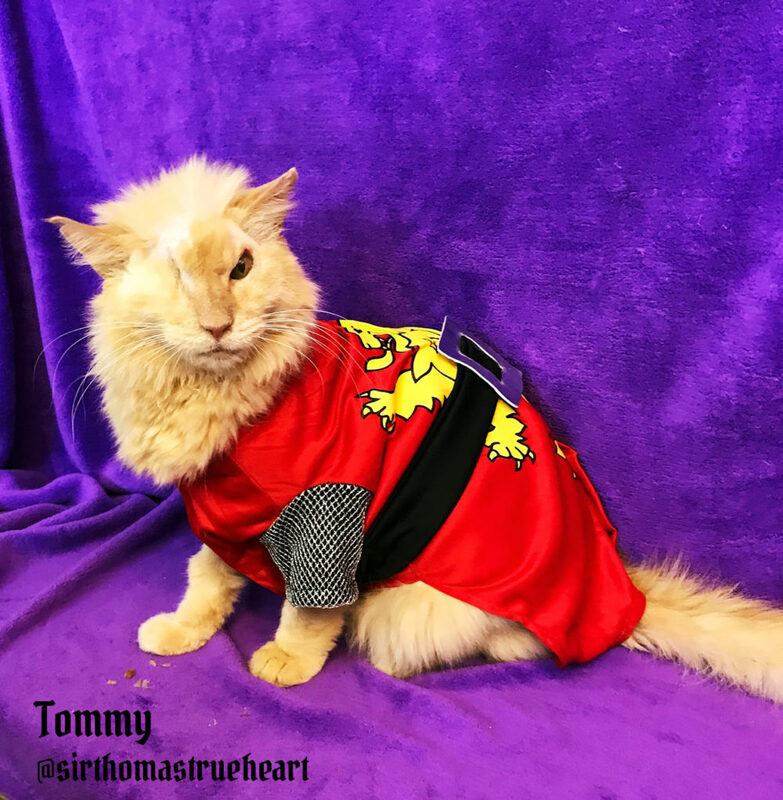 Yes, the heroic larger-than-life cat, Tommy has a suitably majestic proper name: Sir Thomas Trueheart. Like many of you, I became smitten with the leonine cat with one slanted green eye who has achieved celebri-cat status. He is no pretty boy but a man cat with a cause. He’s come a long way. 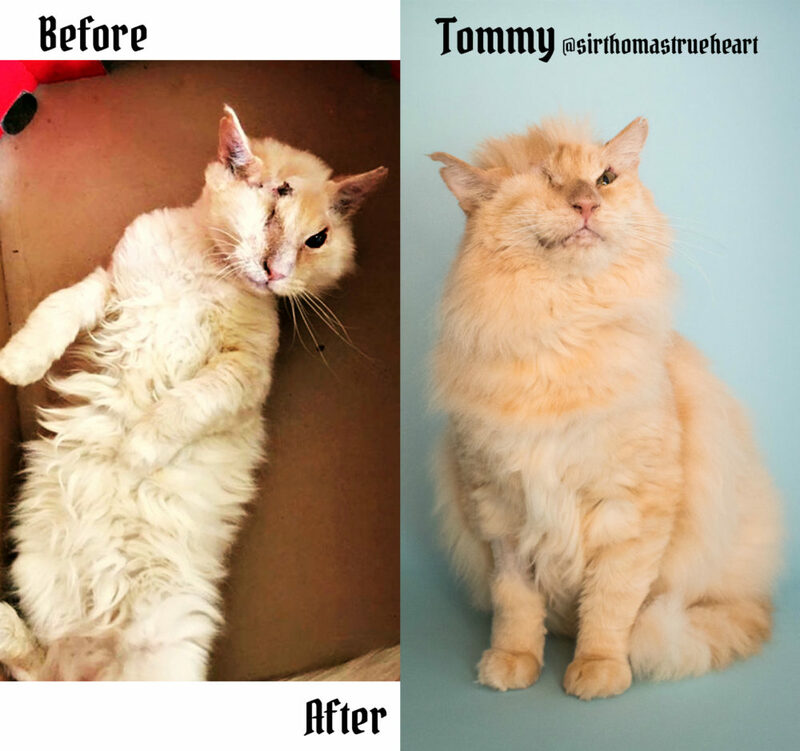 Tommy is a testament to surviving against all odds. Not only surviving but becoming a voice for the voiceless as an advocate against animal cruelty. To inspire means to motivate one create positive change and Tommy inspired me to create the graphics and taglines on a topic close to my heart: The power of love and compassion in action. Warning: some of the images Connie sent me are graphic. I’m normally squeamish about blood but I wanted to create a narrative with the images that speaks to their power. Strong images bring up strong emotions and by facing them we are free to make new choices. As I was editing some of the images I could barely look at them but I kept at it and I’m glad I did. They speak of the sacredness of life despite ignorance, the will to live without judgement. We live in world of darkness but when we shine our light together, we can and will spread more loving kindness. Two summers ago, Tommy lived as a stray in Southern California. He was about five years old and no one knows about his early life. He survived on the kindness of strangers. 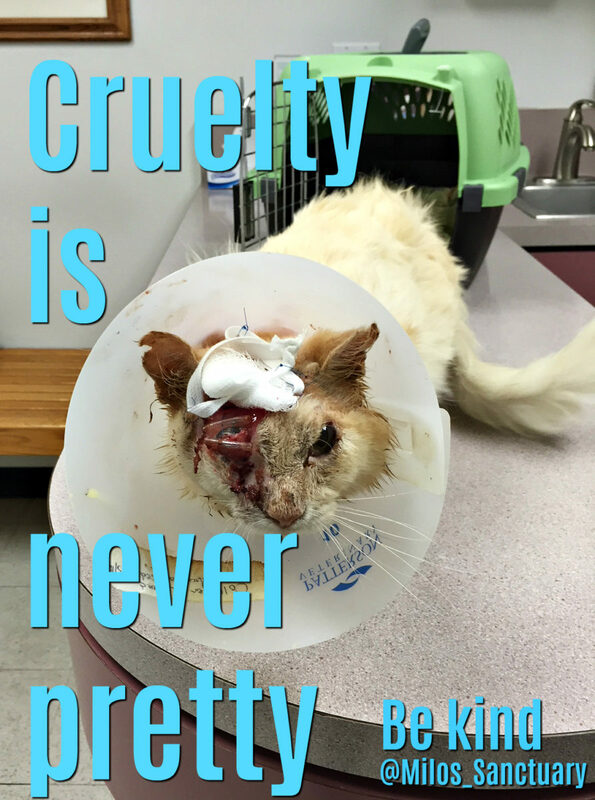 One day, in an unspeakable act of cruelty, someone poured acid on Tommy’s head. It burned through his fur and blinded his right eye. The kind folks who had fed him brought him to a vet who suggested euthanasia. They felt he could be saved and contacted the person who would become his guardian angel. Michele Hoffman Milo’s Sanctuary founder whisked him immediately to their vet. He remained in and out intensive care for three months enduring surgery and skin grafts. His eye could not be saved and since Tommy is FIV+ he required extensive antibiotics for his compromised immune system. Every effort was made to make him comfortable from analgesics to an out-pouring of love online and in person. He also became a de-facto advocate for adopting FIV+ proving they can survive and happily co-habit with other cats. Our FIV+ cat Domino agrees. He’s is doing well at age 15. It’s time old wives’s tales be put to rest. When Tommy left the vet clinic he found his forever home via the Lifetime Care Foster program at Milo’s Sanctuary. It’s where he is doted on and where everyone who meets him falls in love. He adores kids and kittens, treats and chin scritches in his domain. All cats have unique personalities but Connie says, Tommy has that special something. 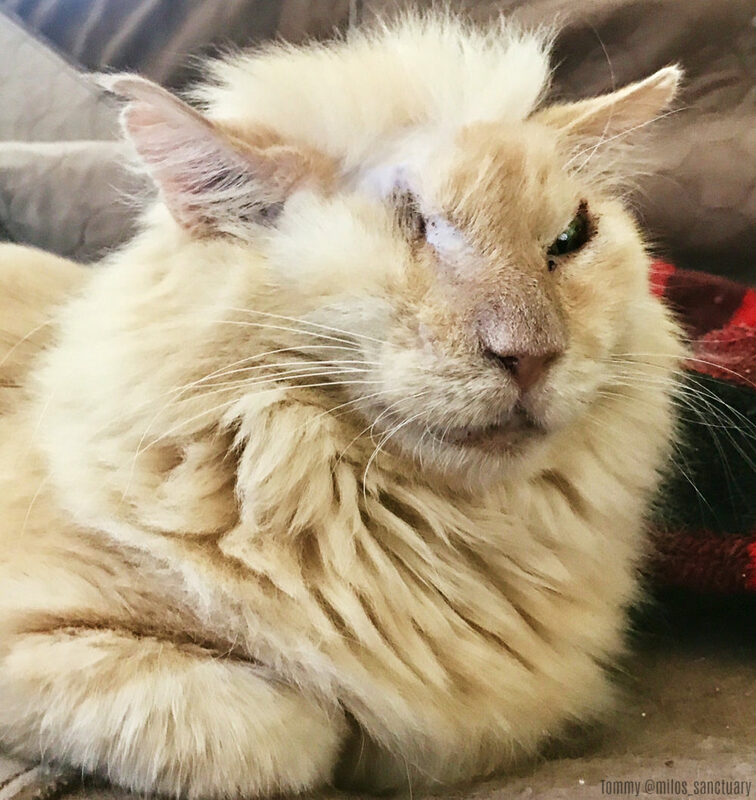 One of his feline admirers is a white, one-eyed gal pal named Daisy. You can keep up with all his adventures on Instagram and Facebook. He is a chill dude and not averse to dressing up on occasion. What’s remarkable is as Tommy gradually healed and acquired his distinctive new look, he fought for his life with grace and trust. It’s as if he knew he had a higher purpose. The best advocates for any cause are those who have direct experience and Tommy has it in spades. He’s matured with the quiet confidence of a wise master who know all. He knows more treats and endless love are in his future. A year after Tommy’s horrific ordeal, his legions of fans continued to grow and CatCon bestowed the honor of Biggest Newcomer award. 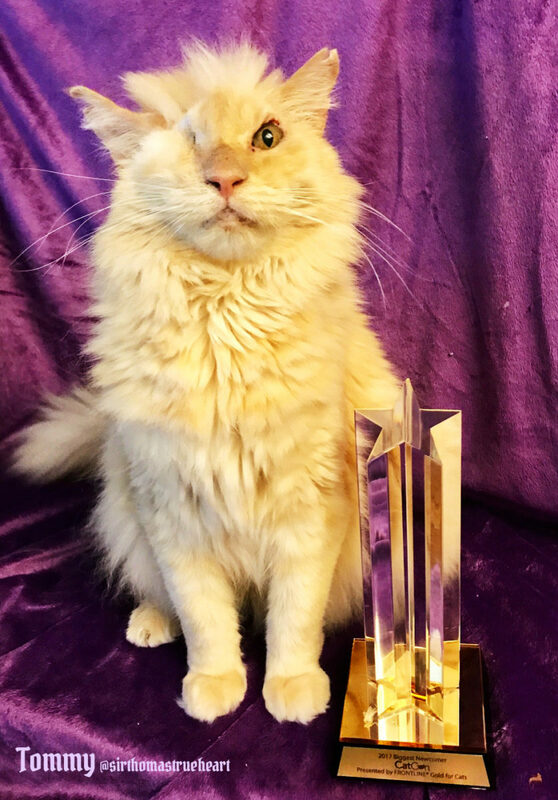 Over the past year, he’s lived up to the award by acting as a purrfect advocate for kindness and compassion, for specially disabled cats and fundraising for Milo’s Sanctuary. This week is all about Tommy. The staff at the sanctuary are honoring him with “Tommy’s Week” and the highlight is the chance to meet him in person. 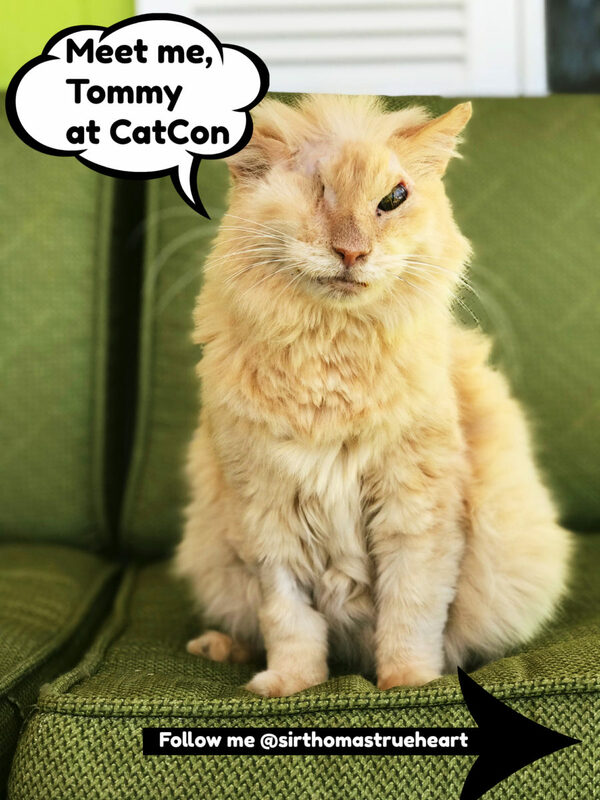 If you are attending CatCon in Pasadena CA, there are meet and greets Saturday, August 4 (sorry, sold out) or Sunday, August 5 (hurry). There will be a panel discussion and photo ops. If you are lucky enough to get your photo taken with him, please tag us! CatCon meet-and-greet sales are not included in general admission but 50% of the proceeds will benefit Milo’s Sanctuary. I know personally how hard they work on behalf of cats in need and they deserve your support. Please note: we have donated a limited collector’s edition of autographed copies of Black Cats Tell All: True Tales and Inspiring Images with bookmarks and available for sale at CatCon at Cat Cafe Lounge and 100% of sales will benefit Milo’s. Word has it, they will be pawtographed by one or more famous cats. We will update details as they develop. Until then, with your help, we can lick animal cruelty. 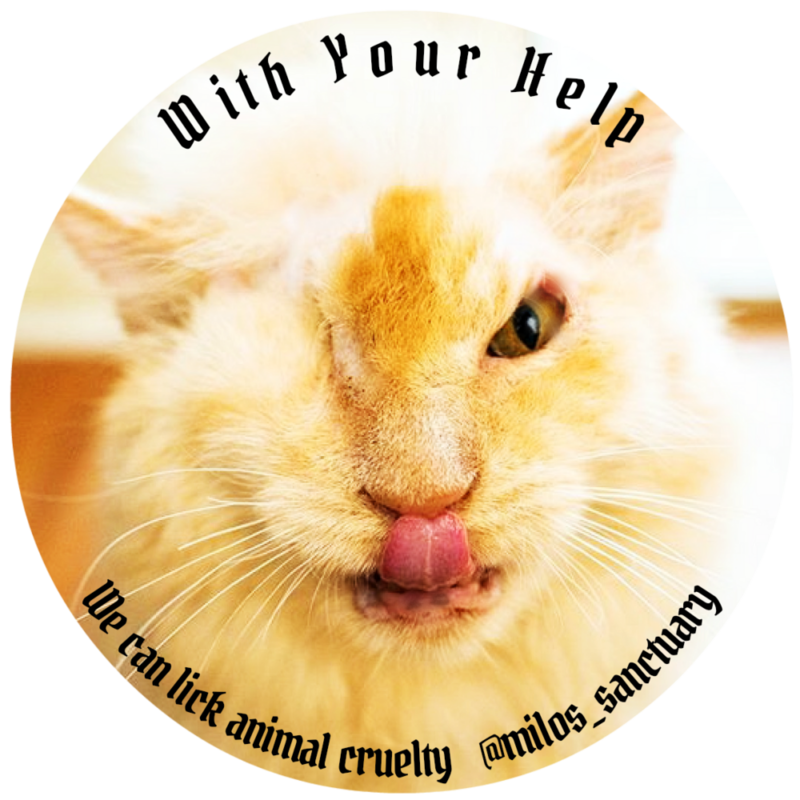 Share this post or make a tax-deductible donation directly to Milo’s Sanctuary. That cruelty was beyond imagination…horrific. 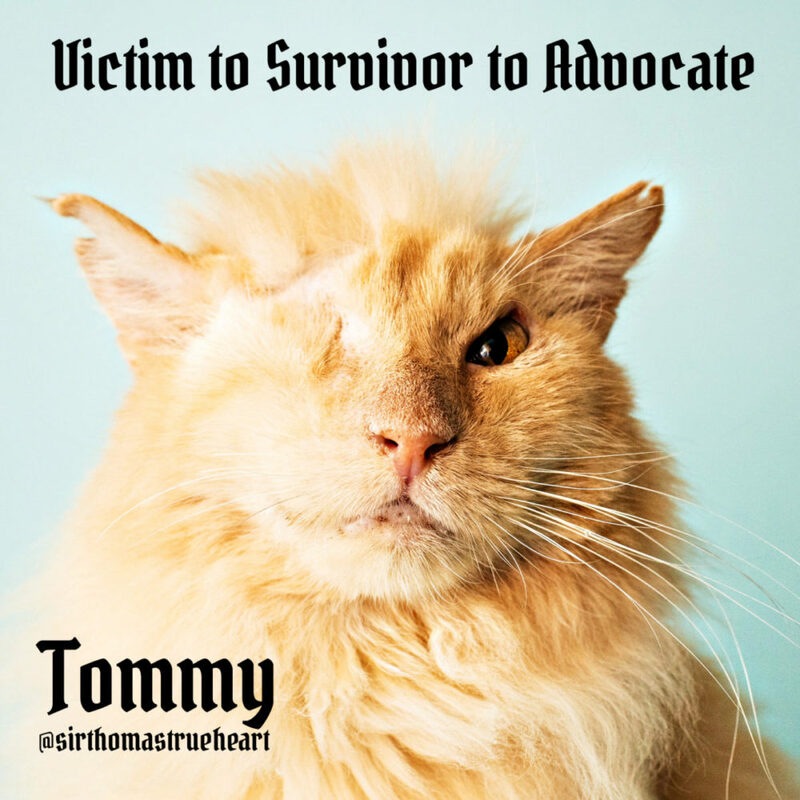 Tommy, what a strong soul you are, to have found kind peeps and with their help overcome all that, so now you can advocate that these things will not happen to others…and that shelters will be only temporary places. I want to hug you, Tommy! I’m going to have nightmares after seeing the terrible thing that an evil human did to Tommy. I am glad Tommy is a fighter, and safe and sound now. And I am glad there are good people in this world, too. It’s tough to see but it galvanizes advocates to keep fighting injustice. We need more people like you who help cats every day. If we could only stop the ignorance and cruelty that is all to often allowed to reign in this world. I thank God and all deities every day for those that fight this evil. Sir Thomas is indeed one of the extremely lucky ones! We are truly grateful for that. We hope and pray that more and more people will take action to stop the abuse,neglect and cruelty that happens every minute of every day to some being somewhere. Thank you Tommy and all of the kind people that have helped him on his journey to recovery and to greater things to help others. Luvs out the Wazoo to all of you!!!! People are so ignorant and sometimes so cruel…. but then there are humans who step up and try and make the hurt go away. Tommy, is truly a fine ambassador he could have chosen to lash out, yet extends a paw. Glad you’ve followed him from the start. He’s come along way but he’s not out of the woods. He’ll have to deal with medical issues for life. My sweet Thomas, I grieve that you had to experience the egregious cruelty of man…..but now, at least, God has opened up the blesses love and joy that we are also able to give. I love you sweet boy and watch you on IG. You certainly deserve every bit of love and adoration you now receive. I only hope that the animal that did this to you is reaping all that he deserves. Your are a Prince among cats!!!! Love from Catsafact, Kess and Little Bit! I’m a big fan of Tommy’s, and it’s always awesome to see him show up in my Instagram feed. Milo’s is a SoCal rescue that we admire lots. Are you going to see him? If your emotions spark positive action and change, it’s good. If you could look at the pictures, we cold Layla. So we did. * ouch * Thank the stars for the Veterinary care, and Milo’s. From great sadness to great joy, and for the benefit of so many others too. When humans share there is truly much magic to be found. Agreed, I believe good can from from bad. We don’t understand how anyone could do such a thing to any living creature (or human)! What pain he must have endured. So glad he has recovered, has a happy home, and is “speaking out” on abuse. he’s very fortunate and I can’t imagine the horrific pain until pain meds were administered. I’ve immediately started following Sir Thomas on IG, and already follow Milo’s Sanctuary on FB. I wish, oh WISH I could go to CatCon, but it’s just too far and too expensive. It’s great that you donated books to the cause too. Giving Thomas a big smooch and hug via the ether! It’s beyond belief but cruelty is a complicated subject. No one is born cruel.